In 2017, 81 percent of U.S. Americans have a social media profile, representing a five percent growth compared to the previous year, according to Statista. 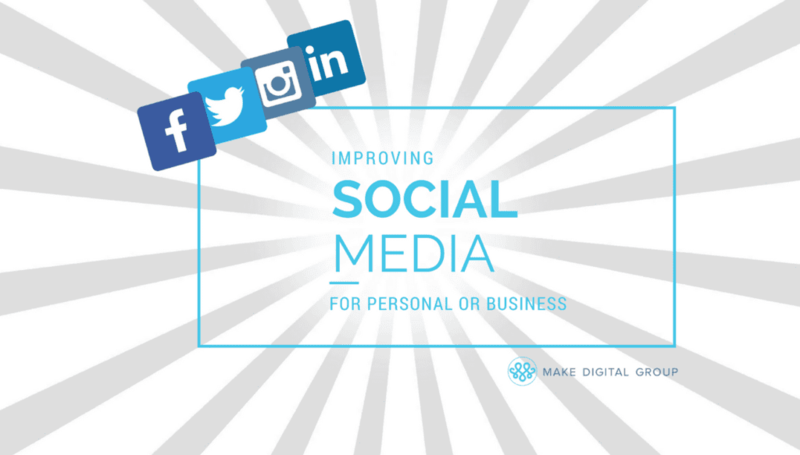 Whether it’s your personal account or for your business, your social media matters. We made a list of the top 10 ways you can improve your social media platforms. Believe it or not, being recognized in a crowded digital space is an important thing. When people are quickly scrolling through their feeds, you’ll want them to be able to recognize your identity or brand without doing a double-take. For this reason, having consistent profile photos will increase your chances of having people follow you on different social networks. Ensuring your social media handles are consistent across networks is also great for recognition, but another reason is for search-ability. When mentioning a brand on Twitter, most people just try and put an @ symbol in front of their name and start tweeting. It can get quite frustrating and confusing when you realize that their handle isn’t just their name, but is some mishmash of words. By keeping a simple handle that reflects your name it will increase the chances of you being mentioned. It also makes it easier for people actively seeking you out to find and follow you. It is important to optimize your profile photo and cover photo for each channel. Why? Many people think that a square is a square, or the social networks will make sure the image fits right. In reality, you never know when profile images will be reused elsewhere on a social network. How will it look when expanded? Does it look different when it’s small in feeds? How does it look on mobile coma pared to desktop? Take a quick second to crop and optimize in accordance with each social platform. Whatever your expertise or niche is, it’s essential that you make yourself discoverable in that field. Adding relevant keywords to your social profiles can go a long way to helping you get there. Identify the terms people search for the most when they’re looking for brands or professionals in your industry. SEMrush and Google Keyword Planner are tools that can help you find those keywords. These terms should appear in your social profiles, most likely on LinkedIn in job titles, job descriptions, and skills. Make sure to work them into your bios in a way that’s sensical, yet professional. It is just as important to make sure that all fields are filled out in your bio. If they aren’t, it can come off as unprofessional or lazy. You shouldn’t just write anything – it’s important that your words are clear, yet engaging and briefly explain who you are, what you do, and why. According to Nielsen, 83% of consumers trust recommendations from their peers over advertising. The proof is evident that people will trust friends and family far more than any advertisements. Having positive reviews on your social media profiles can go a long way in earning people’s trust. While doing so you are increasing your chances of turning strangers into followers, and followers into potential business. You’ll want to use the fields in your profile to link to your other social platforms and/or website as a means for cross-promotion. Unlike other posts that shuffle down your profile feed, pinned posts stay put. This is a tool to use on Twitter, Facebook, and LinkedIn. It is the first post people see when they look up your profile on the three platforms. You should pin a post with a strong piece of content, like an important message, landing page, offer, blog post, video, or other media asset. There are no real limitations on what you can pin—but make sure to pin something. Otherwise, you’re just wasting one of the biggest assets on these 3 platforms. Updating your interests is an easy way to tell people a little more about yourself. Take a minute to look at your likes and interests. You’ll want to make sure to delete or unlike anything you don’t want people to associate with you or your brand. You’ll also want to make sure to engage with posts from these pages, brands, or people. Not only engaging with brands but engaging with consumers is a good way to market your brand. If you have an active social presence, the more likely your brand will be recognized and create an all-around positive social experience. Don’t have time to be active? That’s what we’re here for. No matter what you’re trying to achieve, these simple updates can make your social profiles go from 0 to 100 — real quick. And yes, we mean you can accomplish these 10 tasks in under an hour. These changes will make your social platforms come off professional, socially active, and interesting to your reader.